Think neutral living room design is boring? Nothing could be further from the truth. Neutral rooms can be calm and relaxing, but they can also be fun, dynamic and full of life. The key to achieve a successful home decor is to use a variety of complimentary tones, mix materials, and play with patterns. When decorating with a neutral color project it’s really important to bring in a variety of patterns and textures. It’s possible to create depth and interest, making the room more dynamic, using rich fabric, luxury texture, and noble materials. Be inspired by these 10 neutral living room ideas by the best interior designers around the world. Modern Living room in New York, NY by Kelly Behun. The noble materials and palette were kept warm and luxurious, with touches of gold strategically distributed in the room. An exclusive and contemporary living space by Boca do Lobo. The neutral palette is accentuated by mixes gold, silver and copper accents in the modern furniture. The rich fabrics add a sophisticated touch to this modern room. 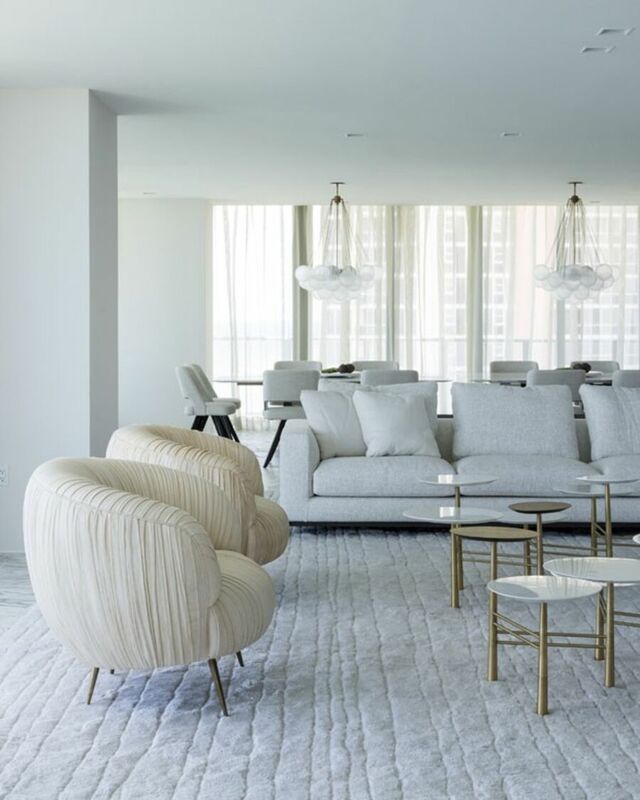 To break the whiteness in this Miami Apartment, small details of gold and milky glass stand out. The white base of this apartment, design by Ghislaine Viñas, completely runs away from the monotony thanks to bold decor element, such as the horse lamp. A whole tone interior design needs some edginess. Large windows bring an intense natural light to the project and it enhances the brightness of the modern furniture. The marble coffee table, acrylic armchairs, and a crystal chandelier punctuate the décor with white and beige tones. Inspired by current trends and this grey living room but with a Lavanda hue, was designed with the finest materials, the exclusive furniture creates an atmosphere of irresistible comfort, gracious hospitality, and impeccable taste. Jean-Louis Deniot created this luxurious contemporary living room design using classic furniture and outstanding floor lamps.The designer plays masterfully with the layering of textures and materials. A family living room that emanates sophistication and serenity. The overall palette was kept soft with whites, creams, and grays in order to highlight the contemporary art collection that exists within the interior space.